Handbells are an integral part of Immanuel’s music program and add beauty and joy to worship. 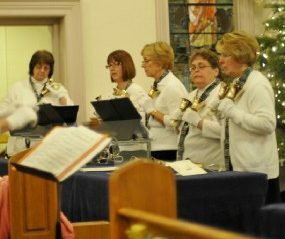 ImmanuBells, a ringing group of 10 people, started in 1992 with the purchase of 3 octaves of handbells and 3 octaves of chimes. We have added 1 ½ octaves of both bells and chimes through Memorial funds. Rehearsals are at 6:30-8pm on every Tuesday evening from September to June and we play at least twice monthly. Shorter-term bell choirs are also formed, with three rehearsals and a play date. Six ringers attended the Festival Conference this summer to improve their skills and ring with hundreds of other handbell ringers. For more information about the handbell program, contact the Director of Music, Amanda Mole, through the church office.